Thanksgiving is just around the corner, and many of us are busily planning the big meal. 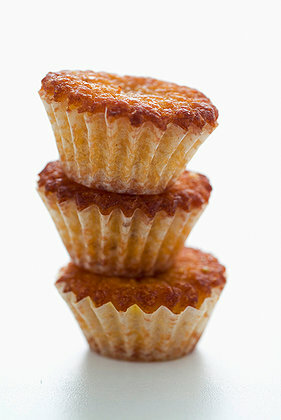 These muffins are a savory take on cornbread, and provide a nice balance to all of the sweet side dishes being served. Combine ½ cup cake flour, 1 cup yellow cornmeal, 1/2 tablespoon baking powder, 1 ½ tablespoons sugar, ½ teaspoon salt, and ½ teaspoon black pepper in a large mixing bowl. Add 6 oz. grated sharp cheddar cheese, ¾ cup chopped reconstituted sundried tomatoes*, and ½ cup thinly sliced scallions and toss. In a separate bowl, whisk together 1 ½ cups of warm milk, 1 ½ sticks of melted butter, 1/3 cup vegetable oil and 1 egg. Fill greased muffin tins up to the rim with batter, and bake at 400 degrees until the tops start to brown, about 20-25 minutes. *Do not use oil packed sundried tomatoes. Buy the dry ones, and soak them in warm water for about 15 minutes or until they become soft and plump.